U.S. Army Sgt. 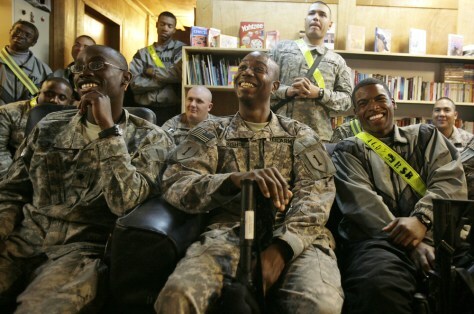 James Bishop, center, and other soldiers from the 229th Brigade Support Battalion, 2nd Heavy Brigade Combat Team, 1st Infantry Division, watch the inauguration of President Barack Obama at Camp Liberty in Baghdad, Iraq, on Tuesday. Across Iraq, many of the 140,000 U.S. servicemembers viewed the inaugural ceremony on televisions in dining halls and breakrooms.